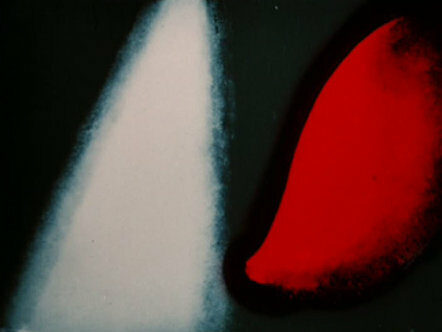 Walter Ruttmann was both a successful representational and abstract painter and an amateur musician before he began examining the possibilities of film technology for the realization of his pursuit of Malerei mit Zeit (‘painting with time’) and subsequently constructed a simple animation table which was patented in 1920 as a method and device for the production of cinematographic images. The official history of both experimental and abstract film begins with the premiere of Ruttmann’s first film, Lichtspiel opus 1 (Light-Play Opus 1), on April 21, 1921. Ruttmann was certainly aware of this himself when he wrote in the invitation to the work’s premiere of the beginning of a truly independent art of film. The critic Bernhard Diebold, who had already demanded abstract film in his writings, also wrote of a new motion art: Painting and music have wed. At the same time, however, Diebold criticized the handcrafted finish of the work. Lichtspiel opus 1 is comprised of a thousand paintings that have been reproduced and colored by hand on the filmstrip. On the screen one sees various moving forms, a swimming, fish-like object, aggressive triangles that thrust into the image, and searching cones of light — a battle between the forms seems to be taking place. The music by Ruttmann’s friend Max Butting (Opus 23 for string quartet) was meticulously composed in correspondence to the film; indeed there are drawings by Ruttmann on the original score that outline the respective occurrences on the screen. It is interesting to note that Butting originally considered the music to be superfluous because he believed the film itself was visual music. From today’s perspective, however, the music appears to be necessary: without music, the dramatic aspects of the film have no impact. As is so often the case in the conception of film scores, here, too, the close collaboration between the filmmaker and the composer produced convincing results. After black-and-white copies of the film — which were for the most part shown without sound — were in circulation for years, in 2005 the film was completely reconstructed in color. Cf. Walter Ruttmann, Untitled [Malerei mit Zeit], probably ca. 1919/1920 (cited in Birgit Hein and Wulf Herzogenrath, eds., Film als Film, 1910 bis heute: Vom Animationsfilm der zwanziger bis zum Filmenvironment der siebziger Jahre, Kölnischer Kunstverein exhibition catalog (Ostfildern: Hatje Cantz, 1977), 63–64) and Jeanpaul Goergen, ed., Walter Ruttmann: Eine Dokumentation (Berlin: Freunde der deutschen Kinemathek, n.d. ), 21. Walter Ruttmann, invitation to the premiere of Lichtspiel Opus 1 in Berlin on April 3, 1921 (cited in Goergen, Walter Ruttmann, 78). Bernhard Diebold, “Eine Neue Kunst: Die Augenmusik des Films,” Frankfurter Zeitung, April 2, 1921 (cited in Goergen, Walter Ruttmann, 98–99). Max Butting, Walther Ruttmann [sic], typescript, n.p., n.d. (property of the Svenska Filminstitutet), 6 (cited in Goergen, Walter Ruttmann, 23).